The south section of the frieze constitutes the last chapter in the story. The fleet is sailing away from the harbour of Town IV in the direction of the home port (Town V). A small rowing boat in front of Town IV, with five oarsmen and a helmsman, seems to be carrying an important person, whose head projects above the throne-like structure on the stern. Perhaps it is a local dignitary who is accompanying the departing fleet as it leaves the harbour. The fleet comprises seven large sailing vessels depicted in two rows, three above and four below. Of these, presumably because of limited space, only three - two above and one below - are shown with their masts raised and only one in full sail. On this ship the passenger section is closed and the paddlers are not depicted. Perhaps the representation of two steersmen and the decoration of its bows with flying doves emphasize the fact that this craft is the swift messenger ship of the fleet. On the remaining ships the mast and rigging are arranged horizontally supported on forked poles. The fine red lines above the heads of the passengers represent long spears, also resting on poles, sometimes topped by a boar's tusk helmet. In addition to the passengers, seated and dressed in white tunics, between 18 and 20 paddlers, intent on their task, are also shown on each vessel, as well as the helmsman. On the ship top left there is another figure who may well be the 'time-keeper'. On the stern behind each helmsman a light construction is depicted, the lower part of which is covered with ox hide. Drawn within each of these 'cabins' is the head of a male figure with a long spear, while a boar's tusk helmet hangs from one of the vertical poles of its frame. These elements suggest that the light structure is a kind of shield to protect the warrior-captain. Various motifs (e.g. butterflies, flowers, birds) decorate the bowsprit of each boat, while the poop, which terminates in a kind of pontoon, is likewise embellished with a representation of a wild beast. Indeed, constructional details of the vessels, with their equipment, means of propulsion and many other traits are rendered so meticulously that the Miniature Frieze could be considered a shipwright's manual of the day. The presence of weapons such as the rectangular shields in front of the helmsman, the spears and helmets, indicates that the ship's passengers are warriors, who are depicted in action elsewhere on the frieze. Thus the character of the entire expedition is revealed as long and dangerous. The fleet progresses from left to right, across the dolphin-filled sea, and sails into the port which is its final destination. 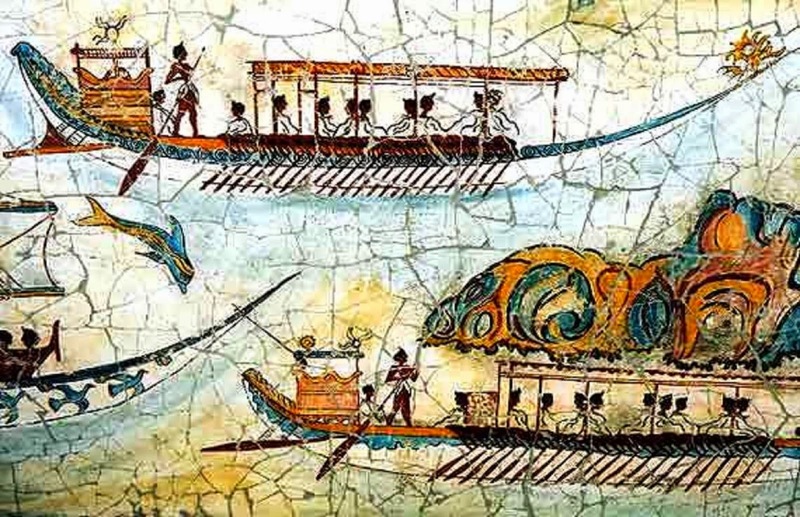 The topographic features of the landscape, the configuration of the habour and the beached boats, the multi-storeyed buildings with Aegean architectural traits, and the appearance of the inhabitants argue for the identification of Town V as Akrotiri. The artist converys the festive nature of the event by showing the population drifting from the town and its environs towards the harbour to welcome the returning mariners. Since the time of its discovery, the Miniature Frieze has been the subject of many interpretations. It used to be claimed that this important monument immortalized a specific historical event - a campaign of Minoans in Libya and the victors returning home in triumph. The section of the south wall, in particular, has been regarded as a kind of sacred regatta in memory of an old tradition, as a symolic depiction of communications and contacts in the Aegean in general, as the representation of an annual nautical festival, or even as a wedding procession. Recent studies recognize in the Miniature Frieze elements which later appear in descriptions in the Homeric poems. Whatever the story shown it must be connected with the master of the West House and concern an event significant for his status in Theran society. Perhaps the Miniature Frieze, which is undoubtedly one of the earlier records of a voyage and overseas missions of the seafarer who lived in this building. Its detailed depictions of harbors and lands bring to mind sixteenth - and seventeenth - century maps and the Miniature Frieze could well be regarded as a Bronze Age 'portolan', and must surely by the earliest known map in Europe.